The Metal Detecting Permit You Need to go Metal Detecting in WA is a Miners Right! There is no such animal as a metal detecting permit in WA. What you need is a MINERS RIGHT, this is simple to obtain, costs very little (currently $25), and lasts you for life. What Does a Miners Right (Metal Detecting Permit) Allow you to do? Pastoral Lease Land - not covered by a granted mining tenement. Prior notice must be given to the Pastoralist. Unallocated Crown Land not covered by a granted mining tenement. Crown Land the which is subject to a lease for grazing and timber that is not covered by a granted mining tenement. Land Reserved for the Purpose of common, mining and public utility. A Granted Exploration licence PROVIDED you have a Section 40E Permit Permit. First - Print out the Application for a Miners Right which you can get from this Metal Detecting Permit or Miners Right form link - yep, I know its really a Miners Right link, but at least you now know the two terms are interchangeable! You must have a Miners Right In WA to go Metal Detecting for Gold. 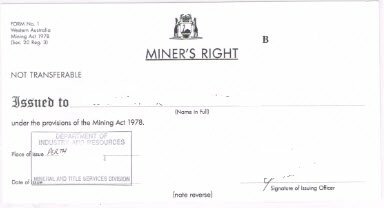 That link takes you to the Department of Mines and Petroleum link to a PDF "Miner's Rights - Information Pamphlet" which includes the application at the back and the address to send the completed application and your $25 (as at January 2019) fee. You can also get your Miners Right by visiting the Perth Mines and Petroleum site at level 1, 100 Plain St East Perth or one of the Mining Registrar Offices scattered throughout Western Australia at the following towns. Provided you visit during working hours the Miners Right will be issued during your visit, you just need to fill out the form, show some Identification and pay your fee. Make sure you visit the Dept of Mines and Petroleum Website and obtain the up to date information on miners rights. We have only provided information in a brief form so you know what to do. Return to Gold Prospecting home Page from metal detecting permit page.